This article is about the battle course from Mario Kart 8 Deluxe. For the race course from both Mario Kart 8 and Mario Kart 8 Deluxe, see Sweet Sweet Canyon. Sweet Sweet Kingdom is a battle course that appears as one of the new courses in Mario Kart 8 Deluxe. The course resembles Sweet Sweet Canyon, and is filled with desserts and pastries. 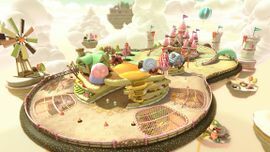 The course is shaped similarly to an "8", possibly referring to the title of the game it is in, and it takes place in the sky with islands and clouds surrounding it. On either side of the map there is a building, which the racers can go under or over. The music is a remixed theme of Sweet Sweet Canyon. This page was last edited on April 6, 2019, at 21:43.